Note: Meet Director will determine if session start times or check-in times for 10/Under sessions will need to be adjusted based on number of entries received for 11/Over preliminary sessions. Contestants must have equaled or bettered the applicable no slower than (NST) SCY or LCM times listed. SCY times will be seeded as conforming times. Qualifying times must have been achieved after February 19, 2006. Entry times for individual relay events shall have been achieved within the two years prior to the meet entry deadline; however, the times need not be the best competitive times of the swimmers but can be any time they have swum equal to or under the event qualifying time. Swimmers entered in the 800/1000 and 1500/1650 freestyle do not need to enter their best times, but may enter themselves at their fastest time or at the time standard. All entry times and USA Swimming memberships will be verified via the SWIMS database. Any athlete not achieving a QT, may be asked to prove the entry time to the Meet Director prior to the start of the meet. Current USA Swimming rules shall govern the meet. Positive check-in is required for all individual and relay events 400 yards and longer. These events will be seeded on the deck. Swimmers and relay teams not checked-in will be scratched from that event. Athletes who have checked in, been seeded, and fail to swim the event will be barred from their next scheduled individual event. Dive-over starts may be used during the 11&Over preliminary sessions at this meet at the discretion of the Meet Manager and/or Meet Referee. Coaches are requested to review Guidance for Dive-Over Starts for Coaches. Officials are requested to review Protocol for Dive-Over Starts. A determination whether to do so will be made shortly after entries for this meet have been processed. All individual events are trials and finals, except the 11-12 500 Freestyle, 10 & Under 500 Freestyle, and the 1000 & 1650 Freestyle, which will be timed finals. Except as noted above, the 10 & Under events will have 1 final heat. The 11-12, 12 & Under, 13-14, and 14 & Under events will have two final heats which will be swum fastest to slowest. A contestant may compete in a maximum of six (6) individual events, and compete in no more than three (3) individual events per day. Special Note: It is anticipated preliminaries for athletes age 11 and older will be conducted in separate courses for Men and Women. Athletes should select their events with that in mind. The 11-12 500 Freestyle, 14 & Under 1000 and 1650 Freestyle events will be swum fastest to slowest. Except for the 10 & Under 500 Freestyle, they will alternate women and men if only one course is used. If two courses are used, the slowest heats may be moved to permit both courses to finish at approximately the same time. The fastest heat of the Women's 1000 and Men's 1650 Freestyle will be swum as the first event of the evening program on Sunday. Positive check-in is required. Verification of time must be submitted with entry. All relays are timed finals and will be swum in preliminary sessions. Exception: The fastest heat of the 13-14 800 Freestyle Relays will be swum as the last event of Friday evening. All certified officials wishing to volunteer to work this meet please contact the Machine Aquatics Officials Chairman, Pamela Starke-Reed, 703-620-4645, ps39p@nih.gov prior to February 19 Please include your club affiliation, certifications held, and sessions you wish to work. Officials volunteering should sign in at the recording table prior to the start of Warm-ups. Certified officials who have not previously advised of their availability may volunteer their services to the Referee at this time. Entries should be submitted using Hy-Tek Team Manager via e-mail. Events for this meet can be downloaded at 41mm022808 . 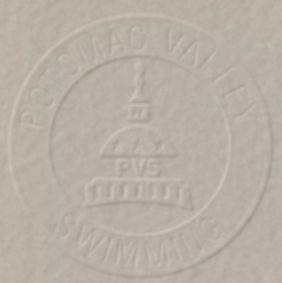 Include in the e-mail subject heading "2008 PVS 14&Under Jo Championship - ****" with the club's initials substituted in place of the asterisks. Also include training site if your club submits multiple entries and number of timers being committed. * Positive check-in required for all individual and relay events 400 yards and over. $ Timed Finals. Heats swum fastest to slowest alternating women and men. Events 1 & 2 will be swum to completion before Events 3 & 4 are started. Fastest heat will be swum as the LAST event in the finals session. Verification of time required. + Swum slowest to fastest this year. Note: Event #37 is not being used.